Born in 1951. 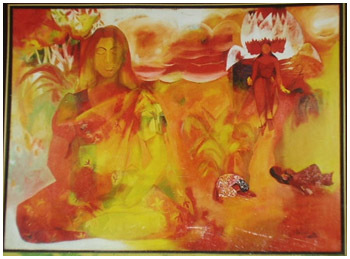 National Diploma in Painting, JNTU, Hyderabad in 1976. Participated in Major exhibitions in India and Abroad viz U K, USA, Hongkong, Singapore, Bangkok, Jakarta, Germany & Sweden organized by Academies, Art Societies and Private Galleries from 1977 onwards. Held seven Solo shows in Hyderabad, Mumbai, New Delhi etc. between 1991 to 2000. Attended Painting, Multimedia workshops and Artists Camps in the country since 1992.